Arts & crafts, outdoor activities, science experiments, and recipes. They're all ripe for the picking! Apple illustrations, facts, activity sheets, word flashcards, puppets and so much more to prepare your group for an apple orchard visit! 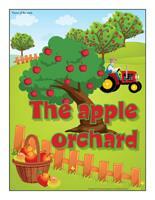 (Open thematic poster-The apple orchard) Print, laminate, and decorate the walls of your daycare with all kinds of posters. (Open educa-decorate-The apple orchard) Print, cut out, and laminate. Decorate the walls of your daycare to set the mood for the theme. 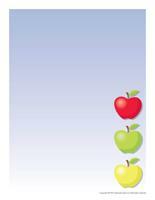 (Open banner-Apple) (Open banner-Apple-small) Print and laminate. Use the banners to decorate your daycare. 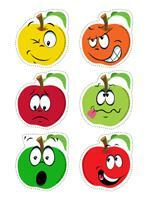 (Open educa-decorate-Apples) Print, cut out, and laminate. Decorate the walls of your daycare to set the mood for the theme. Hang apples from the ceiling in your daycare to add a splash of color. During the Christmas season, you can find shiny apples in most department stores. This activity can be completed over a period of several days. Trace and cut a tree trunk out of brown construction paper (or brown paper grocery bags). Glue the tree trunk on a wall using adhesive putty. Use a pencil to trace a large circle on brown paper. Cut it out and glue it on top of the tree trunk. Cut squares of green tissue paper and have children crumple them. When they are done, have them glue them on the tree. (Open kind word-Apples) Print the apples and have children cut them out and color them using red, green, and yellow crayons. At the end of the day, invite children to bring a few apples home with them so they can ask their parents to write kind words or messages on them. The next day, have children add the apples to your apple tree. You can also invite children to secretly tell you messages or kind words they would like to write for their daycare friends (kind, happy, adorable, pretty, cute, charming, respectful, etc.). This special tool was created in response to a special request received. (Open poster-Apple alphabet) Print and display in a specific location or in your circle time area. (Open Poni discovers and presents-Apples) Print the various cards. Laminate them and cut them. Use a Poni puppet (or another puppet children are familiar with) to present the different types of apples to the children in your group. Joshua climbed up a big apple tree (pretend to climb a tree). The branch CRACKED (pretend to fall to the ground). Joshua landed on the ground BOOM (land on your bottom). Where is Joshua (pretend to search for him)? Joshua is lying flat on his back (lie on your back). Get up Joshua, get up (sit up slowly)! Stand up Joshua, stand up (stand tall)! Variation: Insert the name of each child in the story. (Open Folder-Apples) Print. 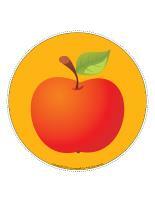 We have prepared printable apple facts to help you present apples to the children in your group. Purchase McIntosh, Cortland, Spartan, Empire, and Granny Smith apples. Cut them into tiny pieces and encourage children to taste them. Use pictures to identify the following parts of an apple: stem (or peduncle), flesh, seeds, core, skin, calyx (under the apple). Show children pictures of an apple tree in winter, in spring, in summer, and in autumn. The pictures may be used as a memory game or to spark a conversation with your group. Use them to decorate your daycare or a specific thematic corner. 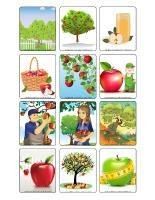 (Open picture game-The apple orchard) Print, laminate, and store the pictures in a Ziploc bag or in your thematic bin. 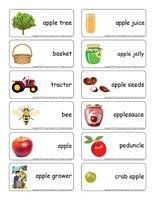 (Open activity sheets-Apples) Activity sheets are suggested for each theme. Print and follow instructions. 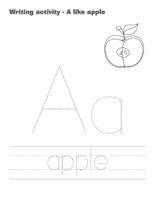 (Open writing activities-A like apple) Print for each child or laminate for use with a dry-erase marker. (Open stationery-The apple orchard) Print. The stationery can be used to communicate with parents, in your writing area, or to identify your thematic bins. (Open educa-nuudles-The apple orchard) Print for each child. Have children color the sheet and use Magics Nuudles to give it a three-dimensional look. Variation: You don't have Magic Nuudles? Have children fill the spaces designed for Magic Nuudles with bingo markers or stickers. To order Magic Nuudles. Have fun with these wonderful workshop ideas created by Caroline Allard. Provide only red, yellow, and green building blocks... to represent apple colors. If you have them, add tractors, horses, and different farm animals to your construction area to represent the farms that are often part of apple orchards. Red, yellow, and green paper children can use to cut out apples, to trace apples using stencils, etc. Hang their work in a giant apple tree displayed on a wall. Red, yellow, and green tissue paper that can be crumpled to fill apple shapes. A painting activity involving apple prints. Make prints with potatoes too and compare the results. Transform your kitchen area to create a pie-making factory. Add aluminum pie plates, rolling pins, homemade modeling dough, etc. Add a large quantity of plastic apples (and other types of fruit), aprons, and oven mitts. 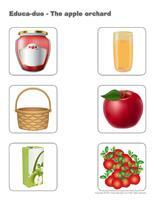 Memory game involving apples with educatall illustrations. Memory, lotto, or other apple-themed games. Red, yellow, and green modeling dough with cookie cutters shaped like fruits or farm animals. Red, yellow, and green beads to make apple necklaces. Use larger beads with younger children. Red, green, and yellow crayons and markers that can be used to draw apples. 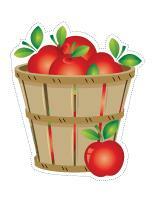 Books about apples and apple orchards or farm animals (visit your local library). 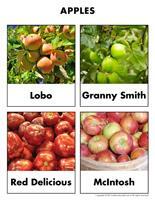 A poster on which the various parts of an apple are identified. Red, green, and yellow apples that can be used to decorate your reading area. A song box filled with the lyrics of several apple-themed songs. Encourage children to massage a partner by rolling an apple on his/her arms, legs, and back. Apple toss, bobbing for apples, hanging apples, etc. Water table filled with apple-scented dishwashing liquid. Fruits and vegetables children can wash in a large tub of water.•	Farm animals. (Open game-This is my spot-The apple orchard) Print two copies. Laminate and cut out the cards. Glue one copy of each card on the table using adhesive paper. Drop the other copies in a bag. Children take turns picking a card to determine their spot at the table for the day. You may also use the cards to determine naptime spots or for your task train. 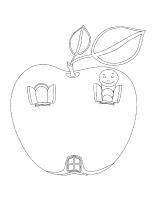 (Open my apple path) Print, laminate, and secure the illustrations on the floor to create a path which leads to areas frequently visited by children such as the bathroom or cloakroom. If you prefer, the illustrations may also be used to delimit your various workshops. 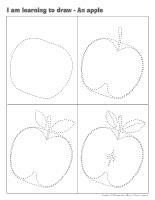 (Open lacing-Apples) Print, laminate, and punch holes around the contour of each shape. Give each child a shoelace or ribbon they can thread through the holes. Sit in a circle with your group. Sing an apple song (or invite a child to sing a song). Children pass an apple around the circle. 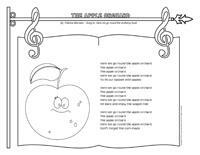 When the song ends, the child holding the apple must complete a challenge suggested by the person who sang the song. For example, the child can be asked to stand on one foot, perform a somersault, hop three times, etc. Divide your group into two teams. You will need three apples: a red one, a green one, and a yellow one for each team. You may use real apples or apples cut out of construction paper. You will also need a basket for each team. Hide the apples and the baskets in the daycare. Each team must find a basket and an apple of each color. This game can also be done in your yard. Give each child an apple and encourage them to move their apple using different body parts. They can, for example, move their apple using their foot, their knee, their thumb, their nose, etc. Divide your group into two teams. The first child in each team must walk from one line to another and then back again with an apple between his/her knees. If the apple falls, the child must reposition it before continuing the race and handing the apple to the next child in line. Children must roll apples through various obstacles such as under a table, under a chair, between two toys, etc. Arrange exercise mats on the floor and encourage children to perform somersaults as if they were apples rolling on the ground. You will need baskets (or other containers) and plastic apples. If you do not have enough plastic apples, use small red, green, and yellow balls. Invite children to toss the apples in the baskets. 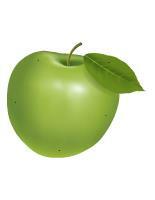 (Open models-Apples) Print several apples and color them with yellow, red, and green crayons. Hang them in a tree. Give children a variety of instructions. For example, ask them to pick one apple of a specific color. Determine a course that children will have to complete. Divide your group into two teams and have them form two lines. Children take turns completing the course while carrying an apple on a spoon. Deposit several plastic apples (or red, green, and yellow balls) on a parachute and have fun making them bounce up and down by moving the parachute. Use plastic apples or small balls to reproduce a traditional lawn bowling game. With sidewalk chalk, draw apples and apple trees throughout your yard. This activity is perfect for outdoor play, especially if you are using bowls filled with water. The goal is for children to catch a floating apple using their teeth. The first child who succeeds is the winner. Let children eat the apples afterwards. For hygiene purposes, offer a separate apple and bowl for each child. Variation: Instead of placing them in water, you can choose to hang the apples from the ceiling using string. Ask children to leave their hands behind their back. When they successfully catch their apple, let them eat it. (Open Game-Traffic-Apples) Print and cut out the three apples (red, green, and yellow). Determine a start and finish line. The apples represent traffic lights. When you display the red apple, children must stop moving. When the yellow apple is displayed, children must walk slowly, whereas when the green apple is displayed, they must walk rapidly or run. Variation: Hang a red apple illustration, green apple illustration, and yellow apple illustration in your daycare so they form a triangle. Children begin under the yellow apple. They must crawl until they are under the green apple. Have them hop on one leg until they are under the red apple. At this point, have them move backwards. For example, ask them to walk backwards to the green apple and spin around twice. Finally, have them slither along the floor to the yellow apple, like a worm. (Open story apples) Before children arrive, hang several apples in the trees in your yard. Children will be excited when they discover the apples. Encourage them to pick the apples. When they have collected all the apples, present your circle time outside. Cut an apple and show children what an apple looks like on the inside. Show them the star each apple contains and read them the story. Hide apples in your yard (or in your daycare). Each time a child finds an apple, he/she must deposit it in a basket. When all the apples have been collected, give each child an apple they can eat as a snack. (Open educ-pairs-The apple orchard) Print. Children must draw a line between identical items or color identical items using the same color. For durable, eco-friendly use, laminate for use with a dry-erase marker. 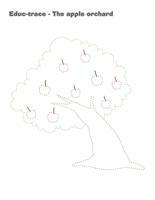 (Open educ-trace-The apple orchard) Print for each child. Children must trace the lines with the correct colors and then color the corresponding items using the same colors. 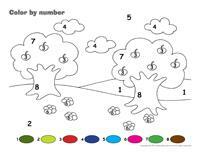 (Open color by number-The apple orchard) Print for each child. Children must color the picture according to the color code. 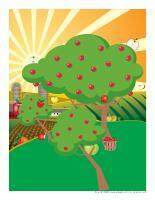 (Open educa-duo-The apple orchard) Print and laminate for durable, eco-friendly use. Children must use a dry-erase marker to draw a line between items that go together. (Open educa-symmetry-The apple orchard) Print. Children must color the bottom picture (black & white) to make it look exactly like the top picture (in color). (Open magnifying glass game-Apples) Print and laminate the board game and the cards. Cut them out and store them in a box or in a Ziploc bag. Children pick a card and search for the item on the board game, using a magnifying glass. Once they have found the item, they deposit it in the correct square, on the board game. 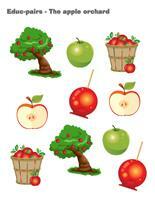 (Open educ-math-The apple orchard) Print and laminate for durable, eco-friendly use. Children must count the objects in each rectangle and circle the corresponding number. (Open educ-same and different-The apple orchard) Print and laminate for durable, eco-friendly use. Children must circle the illustration that is different in each row. 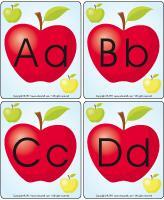 (Open educ-big and small-Apples) Print and laminate the game. Children must place the cards on the board game in the correct order, from smallest to biggest. (Open hunt and seek-Apples) Print and laminate. Children pick a card and search for the illustrated items in the scene. (Open puzzles-Apples) Print, laminate, and cut the puzzle pieces. Children must arrange them to recreate the picture. (Open Games-I'm counting worms) Print, laminate, and glue an action under each apple. Children take turns picking an apple. Have them count the worms on the apple. If they succeed, read the action that can be found under the apple and have them perform it. 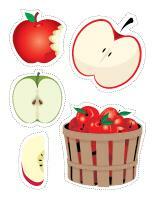 (Open apple theatre) Print, cut out, and laminate the apples. Glue a Popsicle stick behind each apple. Let children create a variety of different scenes with the apples. Place children two by two at naptime. Give each pair an apple and encourage them to use it to massage their partner by rolling it over his/her body. Cut an apple in two. Leave one half on the counter and deposit the other half in a glass filled with water. Throughout the day, observe the transformation of each apple piece. Deposit wet cotton balls in a small bowl. Add a few apple seeds. Watch them grow with your group. Study apples with your group and talk about the different parts of an apple: stem (peduncle), flesh, seeds, core, calyx (under the apple). Place a few apples in a basket and set it on a table. For this activity, children must take a bite of an apple and listen to the sound this produces. Ask children to describe the sounds they hear. Give each child an apple and toothpicks. Fill a plate with various food items such as marshmallows, banana pieces, raisins, apple pieces, grapes, strawberries, etc. Encourage children to create apple characters. Use applesauce for painting. Add red or green food coloring. Children will enjoy manipulating the texture and creating pretty abstract paintings while they are at it. Cook the apples and the sugar in the microwave for 17 minutes on HIGH. Add the butter and pour the preparation in a blender. Mix well. Give each child a small amount of apple butter in a baby food jar. Have them decorate their jar with construction paper or glass paint. Bake apple pies with your group. Let each child make his/her own pie. Ask them to bring their own apron and rolling pin from home. Draw the various steps involved in baking an apple pie on a large piece of cardboard so children can easily follow along. Keep the skin of the apples and use the pieces to create an interesting sensory bin. Spread the apple pie filling on the dough. Sprinkle with brown sugar (to taste, use less if you wish). Warm up the icing and add it to a clean squeezable bottle. Use the bottle to draw zigzags or horizontal and vertical lines all over your pizza. Follow package instructions to bake the dough. When ready, cut the pizza into squares and serve. (Open models-The apple orchard) Print. Use the models for various projects throughout the theme. 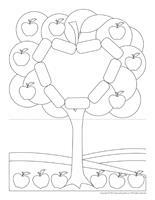 (Open miniature apple tree) Print, cut out, and color. Transform empty toilet paper rolls to make them look like apple trees. Simply have children glue the pieces on the cardboard tubes and hang them from the ceiling when they are done. You will need red construction paper, white construction paper, and green paint. 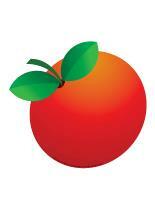 Draw an apple shape on the red construction paper. Older children can cut their apple out themselves. With younger children, you may want to prepare the apples ahead of time. Encourage children to glue their apple on the white construction paper. Once these first steps are completed, apply green paint to children's hands and have them press their hands above the apple to represent the apple's leaves. (Open models-Big apple) Print for each child. Deposit red, green, and yellow tissue paper on the table. Invite children to tear tiny pieces of tissue paper and glue them on their apple using white glue. Encourage them to continue until their apple is completely covered. Display the apples on a wall for the duration of the theme. Give each child a Styrofoam ball and ask them to dip tiny pieces of tissue paper in white glue before layering them on the ball. Hang the Styrofoam apples from the ceiling. Have children make prints of the star found in the centre of an apple. Simply cut an apple in two and apply a small quantity of paint on the flesh. Press the apple halves on white paper. Use an empty toilet paper roll to represent a tree trunk and have children wrap it with brown construction paper. Next, have them cut green cloud shapes to represent the leaves and glue them on the tree trunk. Next, they can add apple stickers to complete their apple tree. Cover the bottom of a cardboard box or container (fairly big) with white paper. One at a time, ask children to dip an apple in red, green, or yellow paint before depositing it in the box or container. Show them how they can gently lift each corner of the box to roll the apple around to "paint" a picture. (Open models-Apples) Print several copies. 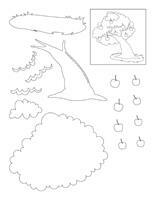 Trace a giant apple tree shape on cardboard and display it on a wall in your daycare. Have children color apples, cut them out, and glue them on the apple tree. Have children paint a paper plate to represent an apple. Cut a stem out of cardboard and glue it on top. Cut a hole out of the centre of the apple. Draw a face on each child's index finger. Show them how they can insert their finger through the hole to make it look like a worm is eating the apple. Glue a brown cardboard rectangle (tree trunk) on a piece of white cardboard. Have children dip their fingers in green paint and then press them all around the tree trunk to represent leaves. Once the paint is dry, press a cork in red, green, or yellow paint and fill the apple tree with apples. Encourage children to paint apple shapes and glue glitter, apple seeds, jelly worms, or candy pieces on them. When taking a walk with your group, have them collect branches. Use string to tie two branches together to form an "X". Hang apples from each set of branches to create mobiles you can hang from the ceiling. Variation: Paint small Styrofoam balls to represent apples and hang them from the ceiling. (Open I am learning to draw-An apple) Print and laminate the model sheet. Invite children to practice their drawing technique and then let them draw an apple on their own. 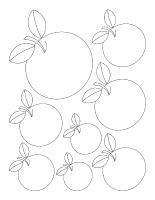 (Open coloring pages theme-The apple orchard) Print for each child.